The CCIPR team recently received many inquiries regarding loud noises in peoples' homes and businesses. We would like to briefly explain a few natural explanations that may attribute to your recent experiences. You may find yourself on our website for this exact same reason, so we are happy to share this information with you and help alleviate any anxiety you might feel in thinking something paranormal might be invading your home or business. The recent artic plunges we have experienced can create some anomalous sounds in your home that you are not so familiar with – even if living there for years. Arid weather combined with plunging temperatures will attribute to the shrinking of the wood and other building materials used to construct your house. Many people have inquired about awakening in the middle of the night by repeated loud banging. However, most cases prove to be the effect of low temperatures on building materials, though, its not necessarily an indication of a serious structural problem. Building materials respond to changes in their environment. The effects are most notable in the winter. 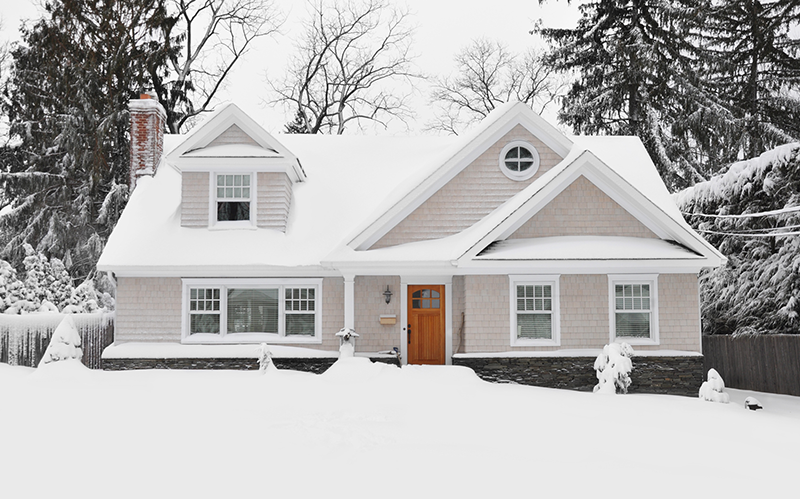 In winter, cold temperatures shrink exposed building materials, which are bound to each other and interior materials by fasteners such as nails. Dissimilar materials shrink at different rates. Porous material, such as wood, loses moisture in dry winter air, making its shrinking more extensive. Extreme and fast shifts between warm and really cold temperatures — a common occurrence in winter when days are warmer with some shining sun but temperatures drop dramatically at night — makes exposed building materials shrink rapidly causing distortion and movement. Additionally, roofs are exposed to cold outside temperatures, while attached interior walls, often wrapped in insulation, are warm from heat moving upward from the floors below. This contrast means the roof is shrinking, typically quickly, while the inside walls are not, which causes distortion in the shape of various roof and attic components, such as rafters. When pressure builds, joints and other areas of connections, such as nails and metal plates between the roof and attic walls, may move slightly, with one component or connection moving away from or toward another. The energy released by this movement is what causes the loud banging or cracking sound - even sounds that can mimick gun fire or footsteps. Movement as little as a quarter of an inch can produce a bang. When warmer, moister air returns in spring, the roof's components go back to their normal size and tension. Another reason for loud bangs and even bed shaking can be attributed to a real geological phenomenon called “frost quakes.” Essentially, your house and foundation could start shaking if the ground around your house experiences one of these natural events all based on water and temperature. An important fact about water is that it’s less dense when solid. That's why ice floats in your water glass or on top of frozen ponds (if ice were denser than water, as is the case for most solid versions of liquids, our lakes would freeze from bottom to top). That fact is crucial in this case because it means that water trapped in the ground expands as the temperature drops below freezing. This expansion forces the earth to shift and even crack. Most of the time, this happens very slowly. However, there are cases when the cracks are close enough to the foundation that it will cause slight to severe movement around the house - especially in older buildings. Your experiences may or may not be attributed to the simple, natural explanations above, but we do ask that you note the temperature outside the next time you experience such an event to see if this information might give you a plausible, earthly explanation for what you might be experiencing. Check out "Haunted Gettysburg" in our book store with more publications on the way. CCIPR continously seeks new members to join our experienced team of investigators.